Aqua Fitness is a great alternative, or addition, to land exercise. It is appropriate for all fitness levels. According to the American Council on Exercise, water buoyancy reduces the "weight" of a person to 90 percent. This reduces the burden on stress-bearing joints and muscles. 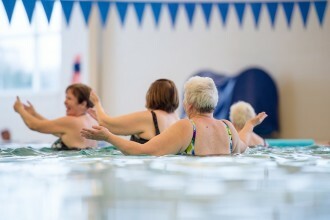 Water aerobics also increases muscle strength. Instead of weights, the water provides a natural resistance to your movements. Being in the water also increases your lung capacity since your lungs are forced to work harder from the pressure of the water. Your long-term flexibility may be increased by performing difficult stretches, being underwater gives you a wider-range of motion. 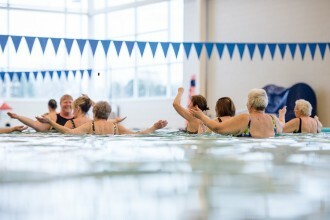 All aqua fitness classes are co-ed, drop in classes, and included in your membership. Schedules are posted on-line at www.sf-ymca.net and on the pool deck. The aqua fitness and swim lesson schedules run concurrently. Class genre and/or teacher substitute is subject to change. All changes are posted daily on white board. All classes utilize music to help motivate you through a full-body workout: strength, flexibility, cardovascular fitness. Instructors teach from the deck and/or the water. Aqua shoes are not required, but highly recommended. Swimming ability is not required, but participants need to be comfortable in water. If you have any special needs, please inform the instructor and they will be happy to assist you. Always bring a plastic water bottle to class. Lockers are available in locker room for personal items; bring your own lock. Class participants must be 14 years or older. No cell phones on pool deck or in locker room.